Chances are, you’re not going to be the only one selling handmade goods under your category at a craft show. If it’s a popular craft show, it will be competitive to get shoppers’ attention and you’ll likely be competing with other jewelry designers, knitters and soap makers at any larger event. I don’t love the word “competition” because each vendor is so unique and I don’t think businesses should spend their energy worrying about the next guy….there’s enough room for everyone! But let’s be honest; we’re all working hard to make sales and a shopper who just bought a pair of earrings is less likely to buy another pair a few minutes later. Generally organizers will keep that in mind when deciding on the layout of the show and do their best not to put similar vendors next to each other. 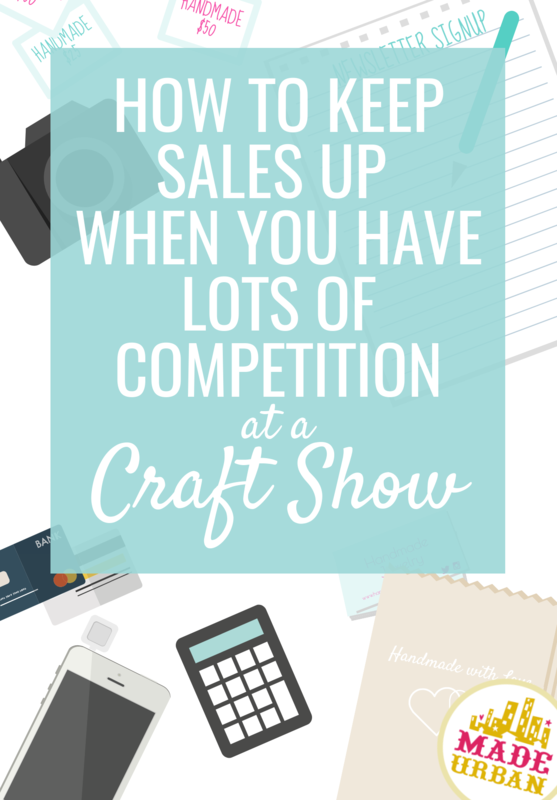 But if you’ve found yourself next to or close to someone selling a similar product, here are 10 tips to set yourself apart at a competitive craft show. COMPETITIVE CRAFT SHOW TIP #1: Is it too late? If set up has just begun and you notice you’re going to be next to someone selling a really similar product, it may be worth it to talk to the organizer. Politely bring it up and see if there’s an opportunity for you to swap spots with another table that isn’t set up yet; it may have been a simple oversight by the organizer. If you and the majority of vendors are already set up before you notice or it’s too hectic for the organizer to rearrange anything….on to the next points! If the layout is set and there’s no way around it, don’t let it get you down. The worst thing you can do at this point is get upset and let it ruin your day. People read energy and if you’re saying “welcome to my table” but are fuming on the inside, that’s going to come across. Put a smile on your face and fake it ’til you make it! You’ve probably practiced and perfected your booth setup but sometimes you have to think on your toes and be flexible. If you have pieces that are really different, put those in an eye-catching area. You can direct that part of the display towards the flow of traffic so they’re the first items people see or move them higher up so they’re closer to eye level. If the competing vendor is literally right next to you, move your higher display items to the edges so there is a clear definition and separation between your two tables. If their table is full of silver earrings, which you sell as well, but you also have rings and necklaces for sale; put those in the spotlight. If you design your setup in collections and zones, it will be easy to shift things around to accommodate each craft show without having to rethink your entire display. If you’re not already designing your products in collections, download my free chapter MAKING PRODUCTS THAT PROFIT to learn why they’re so important and how to create them. If you want to learn how your display should be sectioned to create flow, zones and help increase sales, download the full ebook. Interaction with vendors is a huge aspect as to why people buy at craft shows so although the person next to you is also selling silver earrings, you have a unique story behind the inspiration, designs and creation of your items. Speak up and share that with shoppers; it’s your job to point out your product’s selling features. Although you both may use sterling silver and file, buff and polish each piece to get the most flawless surface; if you point it out and they don’t, that’s a selling feature that sets your work apart. Don’t assume that shoppers know these things. If you’re unsure what you should be sharing with your shoppers and how to do it in a way that feels natural, the worksheets in Chapter 9 (Perfecting your Selling Skills) really helpful. Check out the outline on this page. This should apply to your booth regardless of where you’re placed in relation to other vendors, but the more your setup allows people to interact with your product, the better. People are more likely to buy if they touch or pick up the merchandise. Make sure it’s not crowded or feeling too fragile; if customers are afraid to pick items up in fear of knocking something over, that could cost you sales. You also want to be sure that everything is clearly priced. I’ve heard it 100’s of times; shoppers don’t want to ask how much an item is, it makes them uncomfortable. Uncomfortable shoppers are less likely to buy. If they’ve just purchased a pair of earrings right before hitting up your booth but they still peruse your items, be sure you have business cards available for them. They may have spent their earring allowance for the day but if they like your work, you want to be sure they can find you after the show. That’s not to say you should be accepting I.O.U’s but you should do your best to bring plenty of cash for change and invest in a portable system like the Square so you can accept credit cards. You really don’t want customers heading to the next table because you can’t break their $100 bill or accept their credit card. I also can’t tell you how many times someone had to “just run and grab some cash” because I didn’t have a credit card machine (no excuses but they definitely weren’t as accessible as they are today) and they never came back. When you have to send a customer to a bank machine, you’re not only adding extra work for them, you’re giving them time to think about whether they really need that necklace and if they really want to walk all the way back. I’m lazy. And I’ve definitely used the line “ahh, I don’t really need it” when the item I was lusting after a few minutes ago requires extra time and steps. Don’t start slashing your prices to make some sales. Not only are you undervaluing your work, you’re undervaluing other artist’s work. It’s one thing to mark down out of season stock, but when a customer looks at your shiny new products and sees that everything is half the price of other artist’s work, they may start to think of fair prices as overpriced…and that’s no bueno for the craft community. Those customers may also be confused when they see you at the next show and your prices are back up. Stick to what your products are worth and explain their value instead. COMPETITIVE CRAFT SHOW TIP #9: That being said, how bout a promotion? Cutting prices and running promotions are 2 very different things. Running a promotion still shows the shopper the true value of the item but gives a little incentive to buy now. Again, don’t undervalue your work; make sure your costs are being covered and you’re still making a profit. But think about how you can give the customer a little more value for their purchase. Perhaps you can offer a 10% discount on the second item people purchase from you. This may grab a shopper’s attention to stop and look around as well as increase your items per transaction which is always a good thing! Hopefully you have some extra signage materials in your craft show toolkit so you can whip up a sign. Try your best not to make it look like it’s last minute though; “10% off” scribbled on a scrap piece of paper that’s been ripped out of a notebook makes your setup look unprofessional and like you’re panicked for sales. Even when you live in a big city, you tend to see the same vendor crowd from show to show so you may end up down the aisle from them again. Take a look around the event; is there a repeating theme when it comes to other vendors in your category? Do you all seem to have the same neutral tablecloth? Are similar risers and display items being used? Shabby chic is a popular these days so you may see an opportunity to stand out by creating a really modern display. Or if everyone is sticking to neutral backdrops, perhaps a pop of color will catch shopper’s eyes and be a way for people to immediately recognize your brand at shows. Check in on your products too. If you’re losing sales to other vendors something similar, it may be a sign you need to tweak your products. Download the free 43 page sample chapter (MAKING PRODUCTS THAT PROFIT) from my ebook MAKE MORE MONEY AT CRAFT FAIRS. It will go through, step-by-step how to assess your products and determine if they’re making you as much money as they could be and the worksheets will help you make effective changes. 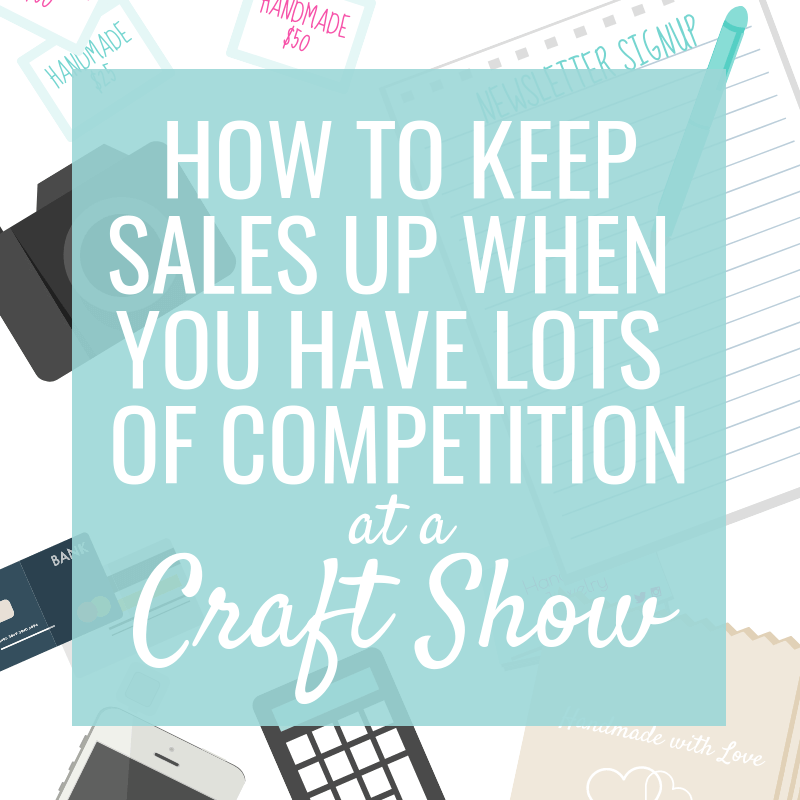 Have you been positioned next to a competitor at a craft show? How did you deal with it? Tell me in the comments! I was positioned next to someone who was selling the same items as me. Her style was different, though. But what made it doable was that we both had good attitudes and talked shop between customers. I think we both learned a lot and left friends!